The death of a truly civilized individual always strikes me hard — as if the species will soon be completely extinct from Planet Earth. 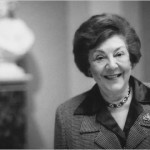 Olga Raggio (pictured), an internationally known scholar and curator who in almost 60 years with the Metropolitan Museum of Art organized some of its best-known exhibitions, was one such person. I knew her slightly, which is why I read her obituary in today’s New York Times with sadness.